The BBC Third Programme was a national radio service produced and broadcast by the BBC between 1946 and 1970. It first went on the air on 29 September 1946 and quickly became one of the leading cultural and intellectual forces in Britain, playing a crucial role in disseminating the arts. 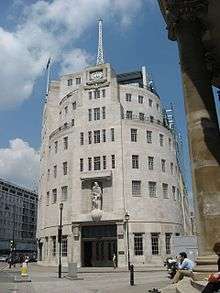 It was the BBC's third national radio network, the other two being the Home Service (mainly speech-based) and the Light Programme, principally devoted to light entertainment and music. The Third Programme was replaced by BBC Radio 3 on 4 April 1970. When it started in 1946, the Third Programme broadcast for six hours each evening, from 18.00 to 24.00, although its output was cut to just 24 hours a week from October 1957, with the early part of weekday evenings being given over to educational programming (known as "Network Three"). This situation continued until the launch, on 22 March 1965, of the BBC Music Programme, which began regular daily broadcasts of classical music (with some interruptions for live sports coverage) on the Network Three/Third Programme frequencies between 7.00 and 18.30 on weekdays, 8.00 and 12.30 on Saturdays, and 8.00 and 17.00 on Sundays. The Third Programme continued as a distinct evening service, and this continued to be the case for a short while after the inception of Radio 3 in 1967, before all the elements of the BBC's "third network" were finally absorbed into Radio 3 with effect from Saturday 4 April 1970. The Third's existence was controversial from the beginning, partly because of perceived "elitism" – it was sometimes criticised for broadcasting programmes of "two dons talking" – and also for the cost of its output relative to a small listener reach. Its existence was against Reithian principles, as Reith himself had, during his time at the BBC, been against segmenting audiences by splitting programming genres across different networks. From the start though, it had prominent supporters: the Education Secretary in the Attlee government, Ellen Wilkinson, spoke rather optimistically of creating a "third programme nation". When it faced those 1957 cuts, the Third Programme Defence Society was formed and its leaders included T. S. Eliot, Albert Camus, and Sir Laurence Olivier. The network was broadly cultural, a Leavisite experiment dedicated to the discerning or "high-brow" listener from an educated, minority audience. Its founders' aims were seen as promoting "something fundamental to our civilisation" and as contributing to "the refinement of society". Its musical output provided a wide range of serious classical music and live concerts, as well as contemporary composers and jazz. Voice formed a much higher proportion of its output than the later Radio 3, with specially commissioned plays, poetry readings, talks and documentaries. Nationally known intellectuals such as Bertrand Russell and Isaiah Berlin on philosophy or Fred Hoyle on cosmology were regular contributors. The network became a principal patron of the arts. It commissioned many music works for broadcast by the BBC Music Department, playing a crucial role in the development of the career of composers such as Benjamin Britten. Particularly notable were its drama productions, including the radio plays of Samuel Beckett, Henry Reed (the Hilda Tablet plays), Harold Pinter, Joe Orton and Dylan Thomas, whose Under Milk Wood was written specially for the Programme. Philip O'Connor discovered Quentin Crisp in his radio interviews in 1963. Martin Esslin, BBC Director of Drama (Radio), was associated with the network's productions of European drama, and Douglas Cleverdon with its productions of poetry and radio plays. The Programme's contribution to contemporary poetry and criticism was outstanding, under producers and presenters such as John Wain, Ludovic Kennedy, George MacBeth and Patrick Dickinson; here it promoted young writers such as Philip Larkin and Kingsley Amis, as well as the "difficult" work of David Jones and Laura Riding. The Third Programme was for many years the single largest source of copyright payments to poets. The decision to close down the Third Programme was opposed by many within the BBC, some of them senior figures. Within the music division, a 'BBC rebellion' gathered force, with its most vocal members including Hans Keller and Robert Simpson. Ultimately, however, the attempt to prevent the culture-conscious Third being replaced by what Keller called "a daytime music station" proved unsuccessful. ↑ Carpenter, Humphrey (1996). The Envy of the World: Fifty Years of the Third Programme and Radio Three. London: Weidenfeld and Nicolson. ISBN 0-7538-0250-3. BBC Third Programme Scripts catalogue The collection of Douglas Cleverdon, a leading talks and drama producer for the Third, at the University of Delaware Library.